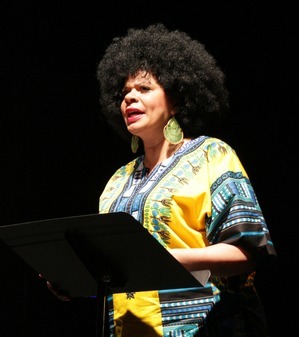 Yvette Heyliger | Hamilton Dramaturgy's TheatreNow! Here is the latest news from Season One’s guests Yvette Heyliger and Yvonne Farrow, who continue to show civic pride and responsibility. Writing the Election is a non-partisan theatre/voter registration event. This purpose of this event, supported by Classical Theatre of Harlem and New Black Fest, is to come together as a theatre community to share our work in the service of boosting low voter registration. The Daily News reported that, “New York ranks 47th in the nation, with less than 64% of eligible residents registered.” The last day to register to vote In New York is Tuesday, October 9th. Writing the Election 2012. Produced by Twinbiz and hosted by Dr. Barbara Ann Teer’s National Black Theatre on Monday, October 29th in Harlem This non-partisan community event is free and open to the public. On-going voter registration will be held in the lobby. You can RSVP for this event on President Obama’s web site. In this non-partisan theatre/voter registration event, writers of all stripes are invited to submit ten-minute plays, short scenes or monologues about the upcoming presidential election. Subject matter can include (but is not limited to) any aspect of the political process: the issues, civic life, government, ideals vs. reality, leadership, public service, voting, etc. Diversity of opinions on either side of the aisle and in-between are welcome! These non-partisan plays, moderated by a guest political pundit, are being read to celebrate the joy of democracy and to inspire citizens to get out and vote on Election Day. Scripts must be submitted no later than September 21st at 11:59pm. For more information and to submit your play* or your directing resume, please contact: Yvette Heyliger at Writing the Election. Actors with cold-reading skills should email/bring pix and resume for on-site casting beginning at 6:00pm. There is no submission fee for playwrights. There is no compensation for the actors or directors. * Plays should be no longer than ten pages, in 12 point Times New Roman font, and in standard playwriting format. Monologues should be one page only and in 12 point Times New Roman font.